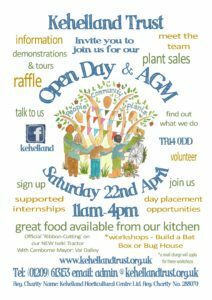 Our first open Saturday needs to be celebrated, so we have re-made it as our annual OPEN DAY! Come along and look around our nursery, enjoy our 16 acre site with wildlife area, Christmas Tree plantation, woodland ride, orchards and vegetable beds. Workshops – Make a Bat Box, or a Bug House with Cornwall Association of Woodturners. Meet the team – Jackie and team in the Bedding and all-year-round colour section, Guy and team on Protected Vegetable Crops and Trev on our Kitchen and Potager garden, herbs & bee-friendly plants. Tours will be available on request by either our site manager or horticultural coordinator. The official unveiling of our new tractor kindly funded by the Claire Milne Trust, our Crowd-fund appeal and private donors. We will properly cut the ribbon on it! Camborne Mayor Val Dalley will be here to cut the ribbon at 12pm and Nigel Rafferty, suppliers of the tractor will also be with us. Learn about the work that we do at Kehelland and sign up to volunteer, join our internship programme, become a trustee or become a trainee.